When I introduce my baking experience. Kindly new friends talk with me in TFL blog. They tell me they also interesting with Chinese bread. 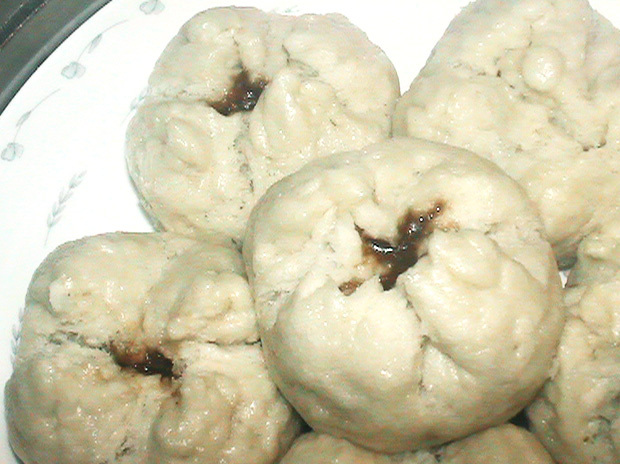 Daisy_A ask me if I have good recipe for Cha siu bao. 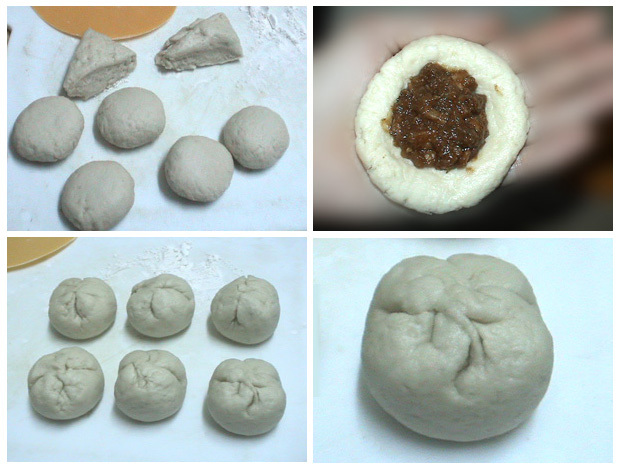 And Daisy_A already try to making delicious Cha siu bao. This food we call Cha shao bao. Since it's from south china rice area. They making this as cake. It's sweet bread with cha shao meat. I take many Cha shao pork When I live in Guangzhou. But for Cha siu bao. I always thought restaurant for saving money no put enough fillings. 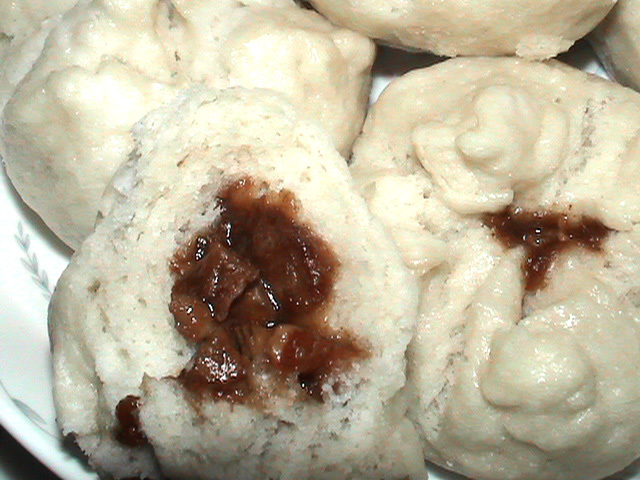 And maybe I more like salt pork bao than sweet bao. So I no often take this cake. For me the BBQ pork more interesting. 1) Mix A to a smooth dough.waitting one night. 2) dough turn into paste. fuller vinosity. 3)Mix A and B, kneed to smooth and soft sweet leaven dough. 4)Apart to 14 pieces. For one about 53g. roll to ball. 5)squash(or crush???) to wrapper,fill into about 33g fillings. 6)You can use cooking paper for every piece(I use one thin gauze). place to steamer. warm place 30 minutes. 7)Boiling water pot. Up the Chashao bao steamer. steam 12 minutes on medium strong heat. I made some mistake when I making. This loaf need enough time polish. The recipe write polish time is one night. I made polish loaf in early morning. Mix with half main flour and house made sweet sour rice wine in morning. So it's only 5 hours. And south China very warm. Here my room only 14 degree. So Maybe I need find more warm place. So I have to waiting to midnight until I think it's ok. This is cake not bread. I made half of this recipe. I use 20ml my homemade sweet rice wine instead of water. I no like very sweet. so I use half sugar of this recipe. You can get infomation from google translator. Such a beautiful picture and no explanation! I like fried dumplings (and steamed dumplings). What are we looking at? How is it made? I'm sorry for I can't delete this post. I post a new one in blog. I can't edit this post. And I don't knoe how to delete. So I have to post a new one. 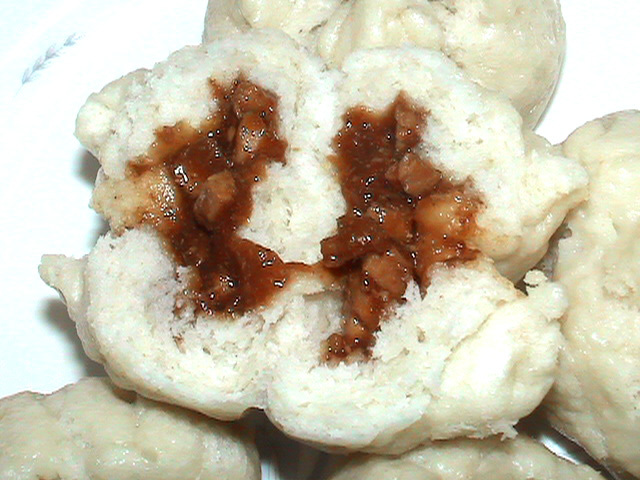 If you like to know how I made this dumpling. I will post more. Thank you for you like this dumpling. You are right. it's delicious steaming cake! I searched all over the internet for recipes and videos of how to make these wonderful things just yesterday! When I lived in California for a short time, we had a vietnamese friend who's grandmother would make these and share them with us. They called them Banh Boa, and the filling is a little bit different and I think they steamed them, but the dough looked very much like the picture you have. I asked at that time how to make them, but never did get the recipe. Needless to say I am eagerly looking for information on how to make them. There are many videos on how to do it, just all in vietnamese. Quick question, is there any yeast or baking soday or baking powder in the Bao dough? Thank you for you like this chashao bao. I use instant yeast and baking powder for the first time try to making. I follow the recipe. I think traditional yeast can making. Thank you Happylina. These sound so good, and looked wonderful. I will hopefully be making them soon. By the way, The lard oil you also can change to another oil. Just color not very white.